A spider is used to measure the amount of twist (cross-line) between the guides. The dial gauge shows exactly how much twist is present, which allows the guides to be aligned within 0.001 inch. NEW - Now available with magnetic feet! Now guides can be adjusted without having to hold onto the spider. Older units can be retrofitted without recalibrating (Tapped for #10-24 thread). NOTE: Spiders can also be used to align the guides on double arbour edgers - the first step for eliminating mismatch!!!! The level is used to set the top guide exactly plumb to the bottom guide without having to hang plumb lines. Use a spider for regular alignment, or as a quick-check tool to help diagnose a sawing problem. Eliminating cross-line reduces the amount of heat generated and reduces the stress on the saw. Ensuring that the blade is plumb results in square cants or boards with no bevel. Levels can also be attached for use on horizontal bandmills. 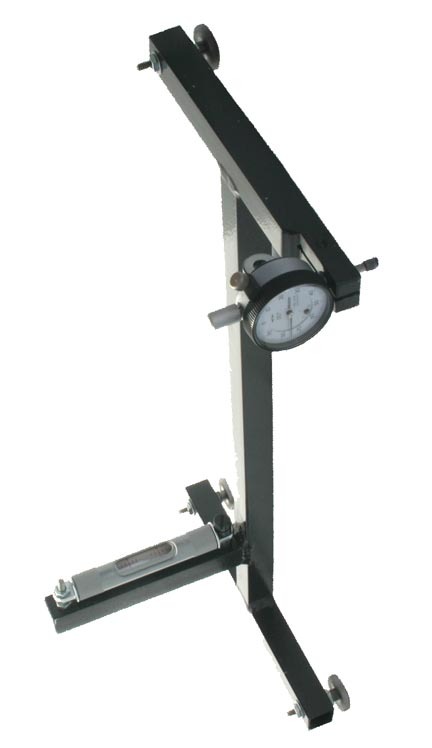 When ordering, please provide the width of the blade and the distance between the guides. 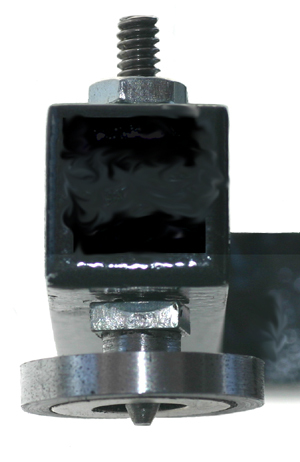 For bandmills with shifting top guides, provide the distance when the guide is in the down position.